How do you put the best 12 years of your life into a five minute speech? How do you put the work of a National Civil Rights organization that has been helping our community for 107 years continuously into the forefront of our minds. How can you teach a 24-year-old man that volunteering and donating to non-profits is important? You do all of the above through leadership development, volunteerism and philanthropy. Exactly what we stood for as young professionals when I joined this movement, and exactly what we stand for now. The great Whitney M. Young Jr once said, “I am not anxious to be the loudest voice or the most popular. But I would like to think that at a crucial moment, I was an effective hope of the hopeless.” All I did is come to these meetings and listen, sat in the back of the room, no intentions of joining the executive leadership team, no motives or aspirations to be in leadership. Knowledge is what I sought and knowledge what was given to me by the Urban League Movement. I knew that I may not have had the deepest pockets in the room but I had the time and heart to give in this Movement. And as you get older, you realize it is important to do the things you love. And the more I got involved, the more I fell in love with our community, the more I cared about the success of the chapter and the well-being of the members. I was asked to be the Membership Chair because the President at the time saw skill-sets in me that I didn’t see in myself yet. But that’s what good leadership is all about, drawing the best effort out of everyone and being able to maximize their strengths to help the team. I was very nervous to even accept the roll of Membership Chair, but I also had the presence of mind to see an opportunity in that fierce urgency of now. That fierce urgency of now that MLK once spoke of. It still remains true that we are stronger when we march forward. It is still true that we I took that role of Membership Chair and grew this very chapter from 22 members to 203 members that I knew we were stronger because of the talent in the room, the skills we possessed, and the drive we had to move our city forward. My leadership position as Membership Chair led me to my first National Urban League conference in St. Louis over a decade ago. I wanted to make sure as my skillsets grew and expanded, so did my network. My first conference reaffirmed that everything they said at the local level was true about our National Movement, and did my network expand? If I said my network expanded tenfold, that would be a severe understatement. Network isn’t even the word I use anymore describe my fellow Urban Leaguers, it's family. The Movement can provide the family for you that the Movement has provided for me. And as my time in the Movement as grown over the years and my roles have expanded to eventually become Vice President and then President of this historic chapter, I’d be lying if I told you I did it all by myself. One thing I learned and will take credit for is finding the people and talent to place around myself on this Executive Leadership Team. If you are continuously the smartest person in the room, you need to find a new room to go in. And this right here is a room I want to stay in, because our chapter continues to bring the very best and brightest that Milwaukee has to offer right here, every third Thursday, and right at the Milwaukee Urban League for our Executive Leadership Team meetings. So,the Executive Leadership Team members that have served alongside me at some point during these last twelve years, I thank you all for your leadership and your service in this Movement. We couldn’t have built the powerhouse and top YP chapter that Milwaukee is today without you. And in my first year as President we went on win the National Urban League Young Professionals "Central Region Chapter of the Year" award and I becoming the "Outstanding YP of the Year" award winner once again, the only person in the history of the National Urban League to win that award twice. In my second year as President just last year we went on win the National Urban League Young Professionals "Select Distinguished Chapter of the Year" award continuing to establish ourselves as one of the top chapters in the nation. And this year finds me back in St. Louis once again next week. The first time as a young new Membership Chair and now 12 years later I’ll be walking into conference as the chapter President and your National Urban League Young Professionals Membership Recruitment and Retention Chair. It will my honor and privilege to lead this chapter to our National conference for the final time. It will my honor and privilege with the support of my fellow Presidents in the region to be named the next National Urban League Young Professionals Central Region Vice President one week from today. I promise you as I continue my journey on our National leadership team I won’t forget about my home chapter, and I promise this next administration when the phone rings I shall still answer, because the work that needs to be done starts at the local level- and members-they too will need all of your support as well in terms of you being a strong committee member and eventually getting into leadership as well. There is a place in this Movement for all of us to serve; there is a spotlight for all of you to be under. The only question is will you walk under that spotlight with me. Will you volunteer with me in these under-served communities, when we knock on the doors of non-voters will you tell them to register, when its your time to lead in this Movement will you answer the call to leadership or will you turn away. We can’t afford you to turn away, and I promise as your next Central Region Vice President I won’t turn my back on you. In my beloved Central Region, and hometown of Milwaukee, may this chapter continue to grow and go to new heights, may you continue to be empowered. After 12 years, 11 national conferences and 10 days left as your President to go-this Urban League owes me nothing, but I owe this Urban League everything. I’m forever yours in this Movement. Important words and phases above that sometimes we really need to step back and ask ourselves does that define me, or define anything I am involved in? I'm going to answer the questions for you in this instance-YES. 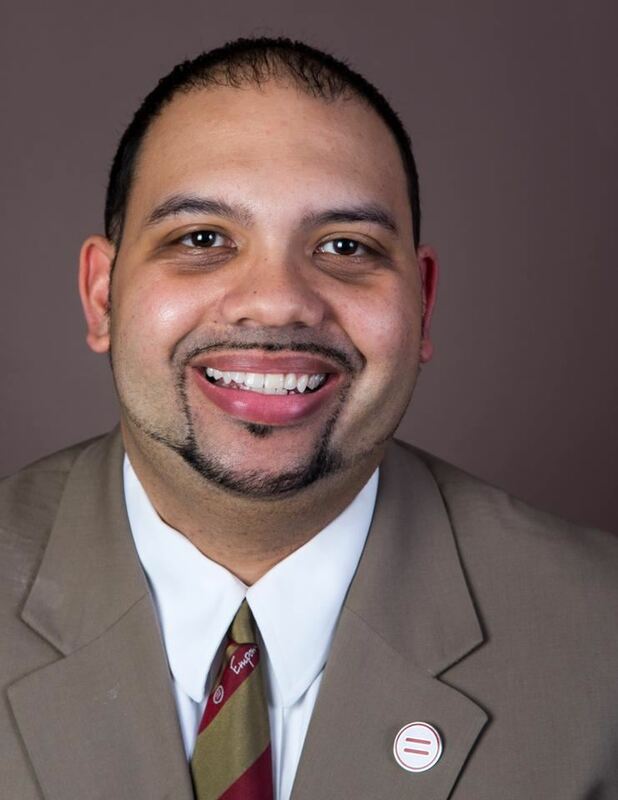 As of last week I was appointed by our National Urban League Young Professionals (NULYP) President Carlos Clanton and the NULYP Executive Leadership Team the new NULYP Membership Recruitment and Retention Chair. A great honor after serving at the local level for the past 12 years. In rare circumstance, before accepting I made it clear I wanted to finish out my term as President of MULYP as it is ending in July and I was ok filling the two roles at once. It is not the norm to be a YP President and sit in a National leadership position, however I am committed to completing my term and ensuring true transfer of powers is being done here in an efficient and effective manner. 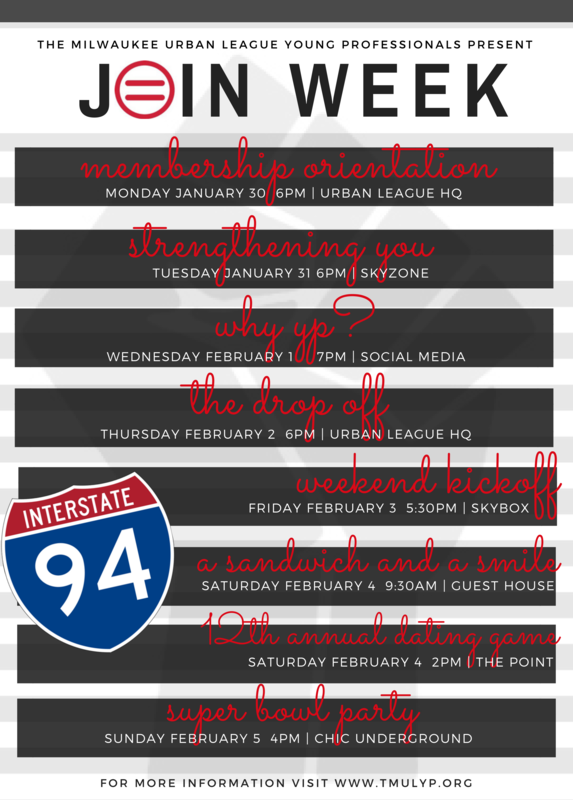 Check Out Our Join Week Lineup! We have a HUGE lineup for Join Week!!! Monday from 6pm-7pm join us at the Milwaukee Urban League 435 W. North Ave for our Membership Orientation. All members AND prospective members are welcome. Bring a friend. Light food and beverages will be served. Email membership@tmulyp.org to RSVP. Why YP? Join the conversation on Twitter using the hashtag #WhyYP with all of our chapters in our National Urban League Young Professionals across our Central Region! Our twitter handle @tmulyp will be in used for out tweets and retweets from you as well! 7pm-8pm. The Drop Off-Thursday drop off your toiletries (deodorant, toothbrush, toothpaste, etc) to us at the Milwaukee Urban League from 6pm-7pm. We will be taking them to the Guest House homeless shelter. Friday come unwind with us at Skybox as we kick off I-94 Serve & Social weekend. Have a drink, grab some food and purchase your Dating Game ticket as well! 6pm-8pm. Saturday afternoon join us at the Point for the 12th Annual Dating Game scholarship fundraiser!!!! Doors open at 2pm! See our Dating Game page under events for full details. Sunday end your week at Chic Underground 770 N. Jefferson st as we watch Super Bowl 51 with our community partner Social X!!! Doors open at 4pm.